The State of the Art series continues with an interview with Graffiti Star LSD. Graffiti’s proponents are a mysterious and interesting bunch, with as much an interest in vandalism for fame’s sake as they have in art..
G: When did you get started? LSD: I started to notice graffiti in the mid 90s when I sneaked off to Hulme because my mum said it was full of bad people! The subways there were just walls of colour, I couldn’t read it and couldn’t understand what it was all about but something stuck. G: How long did it take you to come into contact with other graffiti writers? LSD: I started in High School in the late 90s. I met a guy in my art class, Seize. I seen him writing on his desk in a graff style and thought “I’m havin some o’ that!” I asked him if he could show me how to do it, the rest is history. G: When did you really start making a name for yourself? LSD: It took me a while to be fair, last couple of years really. I changed my name to LSD at a time when the drug had made a big comeback on the underground rave circuit, and I saw it as a huge influence for me to be creative. G: Are there any rules to graffiti? LSD: No. Anyone can do what they want; it’s about getting up and putting something out there. Look at most walls, they need life and colour. 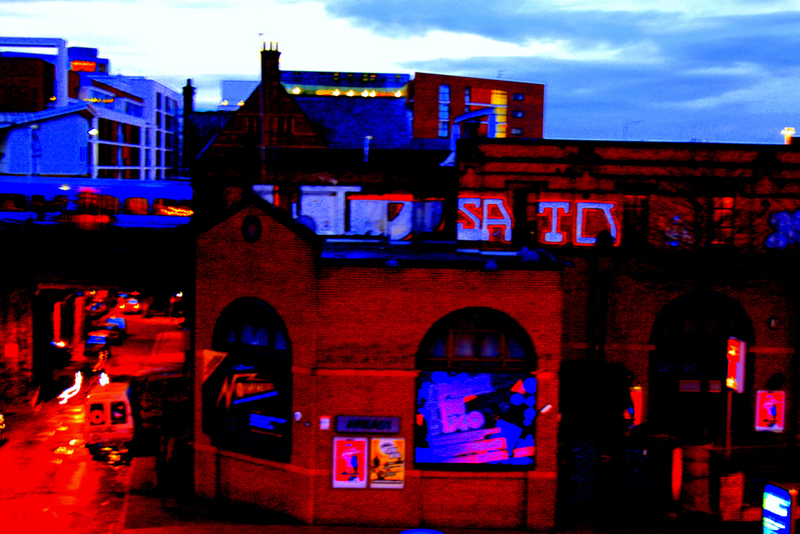 Manchester is too plain! G: Why isn’t there much graffiti here? LSD: The city used to be tagged and now the council are on it plus the scene is dead at the moment hardly anyone making an effort except me...it’s coming back slowly but surely though. G: Who do you respect that’s out there at the moment? G: Who influences you in the art world? LSD: SKP, he does nice psychedelic stuff; we do a bit of work together, go tripping and that, and then work as a group. I explore consciousness. It’s a beautiful experience when combined with art and music. G: Do you do much legal graffiti? G: How connected are your canvases to your graffiti? LSD: There’s an equal balance of creativity and attitude. My spirit is here on the canvases as much as it is on the walls. G: What tools do you like to go out and use at night? LSD: Domestos bottles filled with dead drippy paint and big flippin 2m rollers are my specialities! G: Hard stuff to carry around at night I would imagine?! LSD: Yeah, been getting away with it so far though! G: Do you get positive feedback for your work? LSD: I don’t care if people don’t like it; it’s there for me to look at as much as anybody else. I especially don’t care if other graffiti writers don’t like it. I know it’s cool. G: Why do you write graffiti? LSD: For me it’s like therapy. Making a mess is me letting my anger out, letting the horrible stuff out, life can be a big mess but when im out in the countryside or at home relaxing being at one with myself that’s my peace time. Our world isn’t always peaceful though is it?